This hybrid phone fidget spinner, ring grip, and kickstand is both practical and addictively hypnotic. 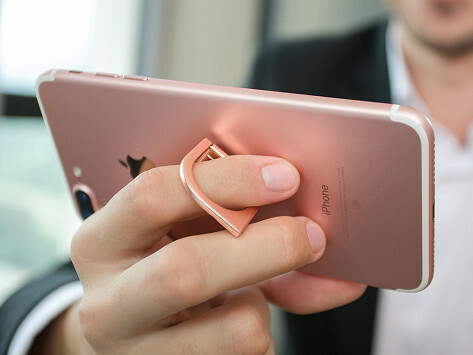 It attaches to the back of your phone to prop it up or spin smoothly without friction. Download the free companion apps to project mesmerizing kaleidoscope-like patterns as you spin. Dimensions: 1.7" x 1.25" x 0.24"
Works great. Fun to spin or put it around a finger for security. It stands my phone up in multiple ways. Transform your phone into a fidget spinner that’s fun to play with AND practical. 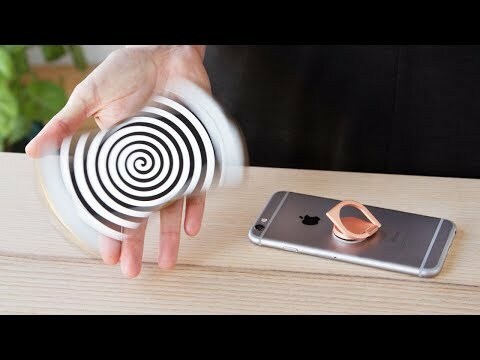 This attachment provides the same hypnotic effect as a spinner, while doubling as a stand and grip for your phone. It’s as amusing to watch as it is to use. The folks who engineered it created two companion apps loaded with kaleidoscope designs so you can mesmerize spectators (or yourself) as you fidget. And the strong hinge creates a smooth, frictionless spin that can go on steadily for up to three minutes and barely slows down. When you’re not entertaining the masses with your light spectacles, its ring design gives you a better grip on your phone and can even be used to prop your phone up. When we were first introduced to Ring Spinner, it kept us entertained for a while. We really like that it combines a playful element with a practical, quality phone grip.